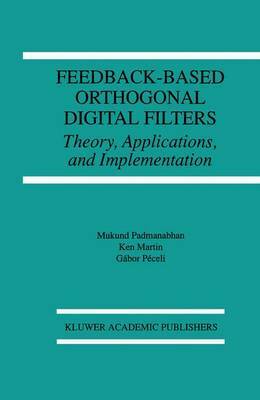 Feedback-Based Orthogonal Digital Filters: Theory, Applications, and Implementation develops the theory of a feedback-based orthogonal digital filter and examines several applications where the filter topology leads to a simple and efficient solution. The development of the filter structure is linked to concepts in observer theory. Several signal processing problems can be represented as estimation problems, where a parametric representation of the input is used, to try and replicate it locally. This estimation problem can be solved using an identity observer, and the filter topology falls in this framework. Hence the filter topology represents a universal building block that can find application in several problems, such as spectral estimation, time-recursive computation of transforms, etc. Further, because of the orthogonality constraints satisfied by the structure, it also represents a robust solution under finite precision conditions. The book also presents the observer-based viewpoint of several signal processing problems, and shows that problems that are typically treated independently in the literature are in fact linked and can be cast in a single unified framework. In addition to examining the theoretical issues, the book describes practical issues related to a hardware implementation of the building block, in both the digital and analog domain. On the digital side, issues relating to implementation using semi-custom chips (FPGA's), and ASIC design are examined. On the analog side, the design and testing of a fabricated chip, that functions as a multi-sinusoidal phase-locked-loop, are described. Feedback-Based Orthogonal Digital Filters serves as an excellent reference. May be used as a text for advanced courses on the subject.